Recently, we came up with FUNtabulous Fridays for our lil Umar Khalif. It focuses on activities related to a monthly theme. 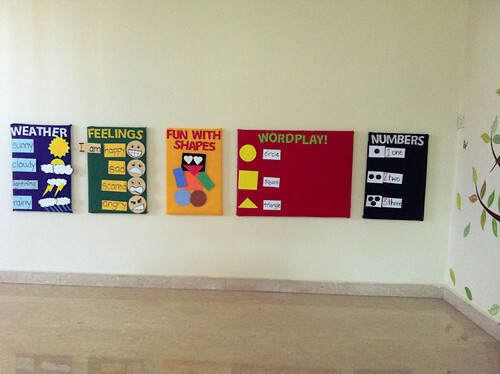 Just a month ago, I did up his “learning” boards and decided to have a monthly theme (but from the looks of it, “Colors and Shapes” is here to stay for another month because I have not touched on colors for the board yet! Yikes!!!) 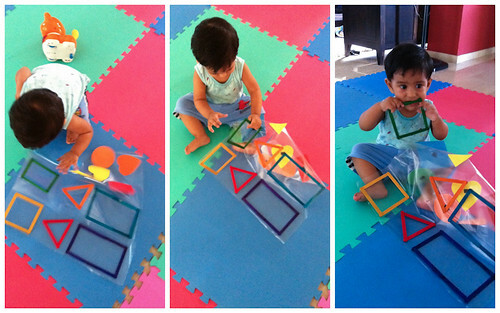 It was during one of his PlayNest classes at Julia Gabriel where I observed something very important about him. Each time there was an activity involving paint, he will not have much interest in it. I was quite surprised because he enjoyed his first and only session very much. 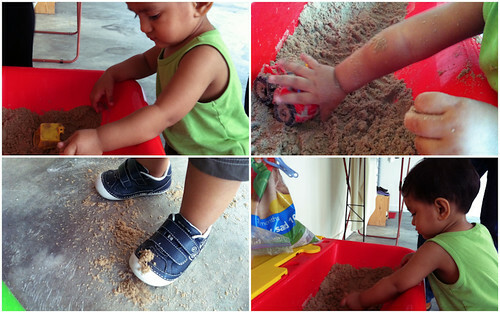 Then, during one of the lessons, there was a sandplay activity. At first, he did not want to play at the sandbox probably because there were too many kids crowding around it. After a few rounds of going down a slide, he returned to the sandbox, which by now was almost empty and he started fiddling with the sand. Surprisingly, he actually stayed in the sandbox to play for the rest of the period. Only then did I realize he really like to play with sand because we take him to the beach almost every weekend. He rejected paint because we only introduced it once to him when he was 8 months old. It took me this long to figure this out! He learns the MOST when he is with us because he is with us MOST of the time. 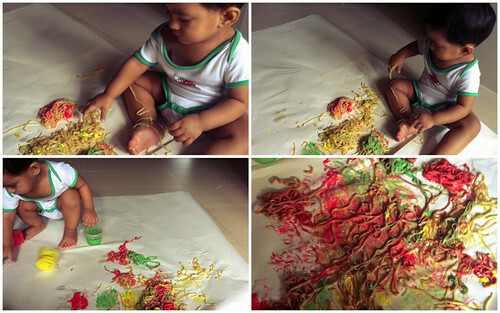 Umar Khalif @ 8 months with paint. He clearly had so much fun with paint that he got himself covered with paint as well. 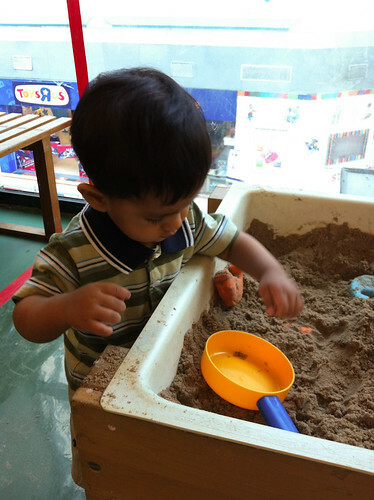 Umar Khalif playing at the sandbox in school. Umar Khalif at Unty Nor’s sandbox! After that, we decided to designate every Friday to have an activity for him. At first, I wanted to plan an activity everyday. However, my husband thought I was being overly ambitious and told me to start small. Once, we have got the hang of it, he said, we can plan more activities for the week. The activities are pegged to our monthly themes and, of course, his weekly or, even daily, activities like swimming, going to the playground or beach, visits to animal farms or simply running around in the park will be a mainstay in our life, too. The theme for this month is “Shapes and Colors”. Umar Khalif with paint and shape cut-outs transparencies attached to a white paper. 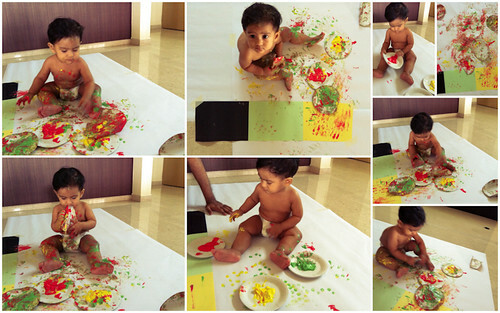 He did not complete this activity because of his unfamiliarity with paint. This is a play invitation. I had shapes made up from ice-cream sticks and have them pasted on a sticky contact sheet. 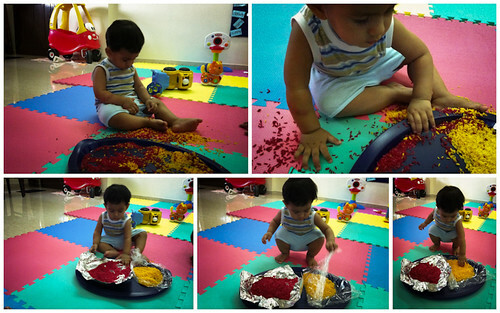 I loved the way he took his time to explore the texture of the aluminium foil, cling wrap and finally the grains of rice. He loved this invitation so much we did a few rounds of it within the week. I hope FUNtabulous Fridays are here to stay for us and it would be sure fun to look back at the actvities he cringed at and those he enjoyed the most. Sweet memories they will be.